Secondary Inscription: (Verso) inscribed "Jacopo Bassano fec Sammlung durazzo Genoa" in graphite. Embracing the celebrated Venetian love of color, Jacopo Bassano made only six large compositional studies in colored chalk. Here he combined blue paper, widely used by Venetian draftsmen, with natural black chalk and colored fabricated chalks, including blue, mauve, red, yellow, and peach. Thoughtful consideration of color was integral to his preparation for painting. Bassano used color, not line, to articulate space. The flesh and peach tones in the reclining males at left project outward, Christ's mauve robe draws the eye into space, and the central figure's red costume provides a focal point in the middle ground. 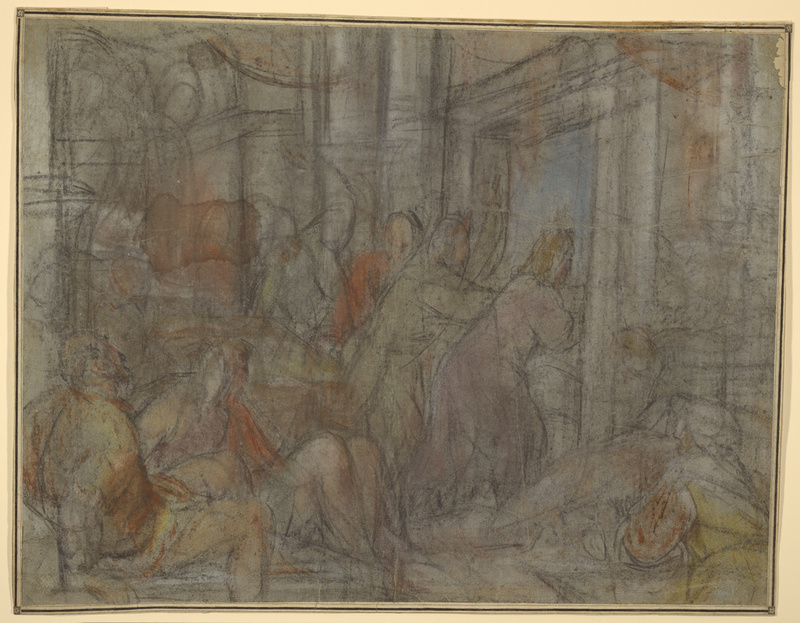 Bassano illustrated an important episode from the New Testament, in which Jesus showed his authority in the Temple of Jerusalem, saying, "Is it not written, 'My house shall be called a house of prayer for all the nations'? But you have made it a den of robbers" (Mark 11:17). After Jesus threw the money changers out of the temple, the chief priests and scribes "kept looking for a way to kill him; for they were afraid of him, because the whole crowd was spellbound by his teaching."